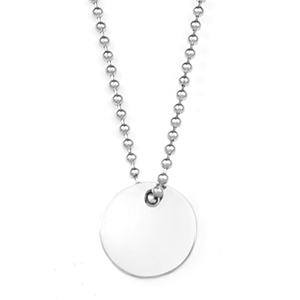 This minimalist, engravable necklace features a simple round disc perfect for personalizing on both the front and back sides. It comes with a shiny steel ball chain and looks great engraved with traditional etch or laser. Add a single initial, monogram, or even custom graphic for an eye-catching look.